Funny statistic from the show. This awesome channel 4 comedy has been on our screens since 2005. It has a very good format mixing great comedy with funny statistics, a brilliant host, quality team captains and generally some good guests; mixed in with some rubbish ones who act as cannon fodder for Jimmy! For some reason Channel 4 don’t seem to sell the series on DVD, surprising considering how popular it is, but there is a ‘best of’ from a few years ago called “Claws Out” which is available on DVD that contains the bits too rude for TV. Here is a collection of some funny quotes and stats from the show episodes in different series. Dave Spikey talking about Michael Jackson, “A reporter said the colour drained from his face. I don’t think so”. 36% of people think the best way to dump someone is over the phone. 9% of men have beeped their car horn at a girl in the street. 54% of teenagers never go to the cinema. 43% of men flirt with people behind their partners backs. 18% of the population have sleepwalked. Women spend on average £100,000 on clothes in their lifetime. 25% of men pretend to be asleep if they hear a strange noise in the middle of the night. 11% of single women have already picked out their wedding dress. 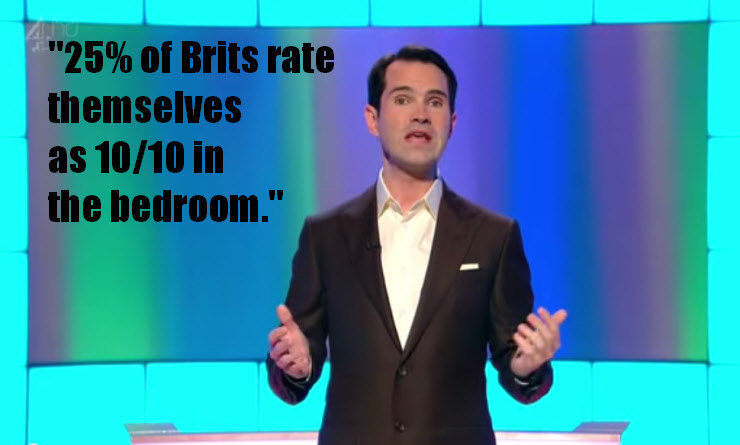 25% of Brits rate themselves as 10 out of 10 in the bedroom. 10% of men lie about their number of sexual partners at school reunions. If you are a fan of the program there is a game you can get and a DVD containing bits too rude for TV. 8 Out Of 10 Cats is a quiz show that consists of 2 teams being asked multiple questions about recent opinion polls and statistics. The show has been airing since the 3rd of June in 2005, with many series being recommissioned. Where does the name come from? The show name itself originated from an old advertisement about Whiskas cat food, in which they say that 8 out of 10 cats prefer to eat the Whiskas brand of pet food. 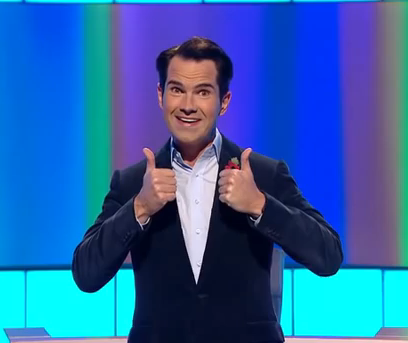 Jimmy Carr is the current host of the panel show. The two teams in this show are each composed of one team captain and two guest celebrities. At the time of writing the team captains are Sean Lock on one side and Jon Richardson on the other side. Previously Dave Spikey and Jason Manford have also taken the captains seat. The show has seen a huge amount of guests, with appearances from a variety of different types of celebrities including; David Walliams, Jack Dee, Rachel Riley, Rhod Gilbert, Lorraine Kelly, Jedward, Helen Flanagan, Richard Hammond, Johnny Vegas, Elliot Gleave, Holly Willoughby and Louis Walsh. The two teams are put through a series of rounds, which are centered around polls and statistics. The show is still bespoken for everyone due to its witty humor. We think you’d have to be barmy to have seen the show and not laugh at least once! The show is produced by Zeppotron for Channel 4. Some of those jokes are funny. The statistics from the show are also interesting. I love reading statistics. They are interesting to read and also interesting to find out how many people feel about certain things. It’s funny to see how you relate to the statistics too, like I’ve definitely pretended to be asleep haha.